Somewhere Else Before: Bass gives the initialization by deep chords which continues throughout this soft and slow song. Well known rhythms of Magnus Öström is at the background. The piano plays a basic theme (a warning sign-like one) in the forefront. Do the Jangle: Similar to some other pieces of E.S.T., this one seems to start directly from the improvisational part. Please give attention to the synchronization between the band members and lightning-fast drummer Magnus Öström. Serenity: This is a melancholic and soft piano solo piece by Esbjörn Svensson. The Wraith: This is the first piece of the album that is electronically supported. A spiral rounding processed rhythm travels between two channels, when percussion and drums full of cymbals emerged. Deep kicks and a dark piano tune is heard above. I am in love with the bass tone here. The tension generally goes low until the last three minutes. I do not know who has pulled the trigger first, but all the members suddenly start to improvise in this last part. This piece is one of their masterpieces considering its ever evolving and building-up characteristics. You should especially listen to Magnus' contribution to the sound and tension. Last Letter from Lithuania: A solo piano entrance is made in first minute with murmurings of our legendary pianist Esbjörn Svensson. Then, as expected, Magnus Öström’s brushes and deep notes of Dan Berglund are at work. This great composition is really emotional. 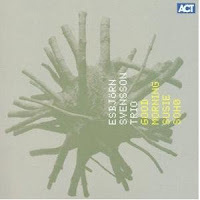 Good Morning Susie Soho: Having the same title with the album, this piece is famous because of the wah-wah effect on the double-bass of Dan Berglund. I like this tone very much. The main melody on the piano is actually really cold but merging with the bass and energetic drums the resultant sound is strong and funny. Magnus Öström’s movements on the drums are just perfect. After the first half, the improvisation raises the tension significantly. The main melody is played again at the end. This is my favorite piece in the album. Providence: The piano talks with the bass while drums are sometimes interrupting this dialogue. A real improvisation! Give attention to Magnus Öström’s great performance on the drums. We hear laughter from the members of the trio at the end, which shows us how they are happy while improvising. Pavane “Thoughts of a Septuagenarian”: A melancholic (real Nordic jazz) piano tune is heard at the beginning which is accompanied by a deep and strong double-bass. The melody fits the name which means thoughts of a human at age of seventies. The main theme played by the piano is so beautiful that I do not want to add any technical comment about it. The drum and bass are passed through electronics near to the end. Spam-Boo-Limbo: A perfect entrance for a great energetic piece. I should repeat it: Esbjörn Svensson is a technically perfect genius musician. The electronic effects used here are consistent with the sound of the album and produces a contemporary jazz masterpiece. We start to hear some electronically supported (distorted) human voices behind the music from time to time. These voices become dominant through the end then turned into a distorted scream of a man. The Face of Love: An almost Mediterranean sound is mainly performed by bow of the double-bass. This composition belongs to D. Robbins / T. Robbins / N.Khan. Esbjörn Svensson is touching to the inside of the piano from time to time. Reminiscence of a Soul: A solo piano entrance is quickly followed by a strict stick beat on the sides of snare-drums. The double-bass plays the same line with the piano. This very calm and quite song which is full of breath is so suitable at the end of such an album. A surprise waits for you at the end of this last song. After the piece is ended, at 6th minute, if you wait one more minute in silence, you will listen to a great performance of trio jazz inspired by a Rachmaninoff melody. Hidden tracks became a tradition for the trio after that album. A really dark main theme of piano is accompanied by strong hi-hats and a bass passed through distortion.